This is the third of a 12-part preview of the 2016 football season. Part 1 focused on the running backs and fullbacks. Part 2 featured a roundtable on the offense. Let’s face it: Being a wide receiver at Stanford University hasn’t exactly been a glamorous job in the last few years. Back in the days of yore, when Ryan Whalen, Griff Whalen and Chris Owusu roamed the earth and Andrew Luck was just a college superstar blissfully unaware that he would one day have his internal organs puréed by big, scary NFL men, there was glamor to be had in Stanford’s passing game. But since then, Ty Montgomery has been the only Stanford receiver to have even made a dent in the national consciousness (apart from a brief Francis Owusu cameo), and Cardinal wideouts’ playing time has been dictated by their ability to block on the perimeters of running plays almost as much as it has been by their ability to… you know, receive. This year’s corps of Stanford wideouts might finally be the long-awaited group that has the potential to change all that. They have breakneck speed in Michael Rector, Isaiah Brandt-Sims and Jay Tyler; they’ve got bigger guys that can bully defenders and make tough catches in Francis Owusu and J.J. Arcega-Whiteside; and, of course, they’ve got the nation’s next breakout star in Trenton Irwin. 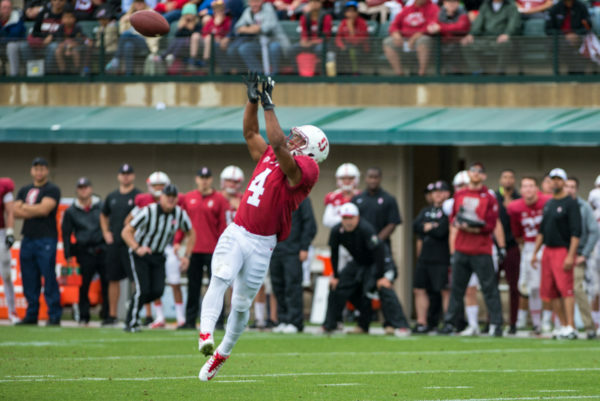 This crew might well have the most all-around untapped potential in any receiving corps Stanford has fielded in its recent history. And of course, the tight ends really need no introduction. Stanford has become a bona fide pipeline for tight ends to reach the NFL, with Zach Ertz and his shiny new $42.5 million contract extension serving as the flag-bearer of the group. Junior Dalton Schultz is set to join the lineage of Ertz, Coby Fleener, Austin Hooper and other alumni as the next elite Stanford tight end, with veteran Greg Taboada and top recruit Kaden Smith (if he’s healthy) providing a talented supporting cast. All that’s to say: Whoever wins the starting quarterback job will have a wealth of talent to take advantage of in the passing game, which certainly has the potential to shine this season if the conditions are right. Oh, by the way, that McCaffrey guy catches passes, too. Lots of them. Michael Rector (WR) — For the longest time, it looked like Rector would forgo his fifth year of eligibility and declare early for the NFL Draft, which wouldn’t have been unreasonable for a guy with NFL speed coming off a 34-catch, 559-yard season. But Rector had a change of heart in the 11th hour and elected to return for his final year at Stanford, and this receiving corps is much better off for it. For the first few years of his Stanford career, Rector’s job was to just outrun everybody and get open for deep shots (and he was good at that), but in the last two years, he’s really developed as an all-around receiver to become more of a go-to receiver in the intermediate game as well. 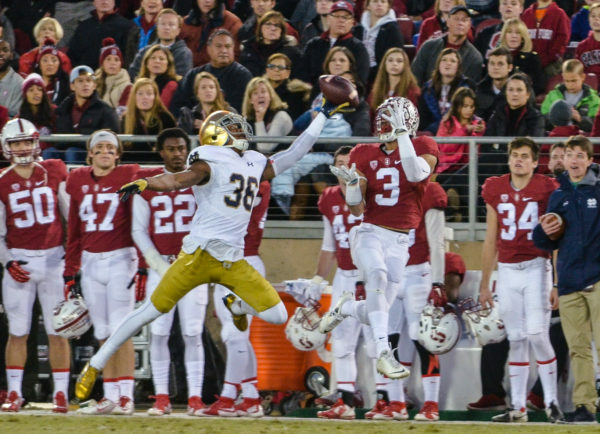 As evidence of that, he led Stanford in targets last season with 55 but still led the team with 16.4 yards per catch, indicating his ability to get open as one of Kevin Hogan’s top options but also his big-play potential. With Devon Cajuste gone, Rector will be the veteran anchor of this group and remains Stanford’s premier big-play threat over the top — but don’t be surprised if he surprises defenses by occasionally showing off his expanded route tree as well. Trenton Irwin (WR) — The only reason I didn’t automatically anoint Rector as Stanford’s No. 1 receiver is because this true sophomore might very well challenge him for that title right out of the gate this season. Even as early as Pac-12 Media Days in July, David Shaw has been dropping Irwin’s name as someone to keep an eye on, and Christian McCaffrey boasted that Irwin is going to be “one of the biggest sparks in college football.” That’s not a boast to take lightly. Irwin was described as the best high-school route-runner that Shaw had ever seen before he arrived at Stanford as the five-star crown jewel of the 2015 recruiting class, and his will to go above and beyond to succeed from the moment he stepped on The Farm was evident. He and quarterback Keller Chryst would stick around for extra reps on their own initiative after practices last season, even though his talent and technique were never in question. Shaw elected to use Irwin in moderation last season, only targeting him 18 times, but he pulled down 12 of those catches for 150 yards — often to move the chains on important situations. Just as the coaching staff took the training wheels off McCaffrey after a limited freshman season and saw the sophomore seize the spotlight, expect the same for Irwin this year. Francis Owusu (WR) — Best known for his surreal catch on a defender’s back against UCLA last season that earned him an ESPY nomination for “Best Play,” Owusu is a guy that came in as a highly touted four-star prospect but still hasn’t taken the next step to carve out a major role in Stanford’s offense. Entering his final year of eligibility, it’s now or never for the big senior, who caught just 13 passes for 175 yards last season and now has to deal with a talented group of underclassmen chomping at the bit for increased opportunities. Dalton Schultz (TE) — The junior tight end is on both Phil Steele’s and Athlon’s All-Pac-12 preseason first team, and for good reason: With Austin Hooper gone to the NFL, Schultz becomes the unquestioned No. 1 tight end on Stanford’s roster, which is a position that has traditionally been a very fruitful and central part of the Cardinal’s passing game. Schultz was the former top recruit out of the state of Utah and was known in high school for his pass-catching ability, but Stanford elected to use him primarily as a blocker last season with Hooper as the top pass-catching option among tight ends, only targeting Schultz 13 times, which resulted in 10 catches for 121 yards. With an expanded role as a pass-catcher, Schultz could show a versatility in both the running game and passing game unseen for quite some time at the tight end position at Stanford. While Hooper was primarily a pass-catching tight end, Schultz was used last season primarily as a run blocker in Stanford’s heavy packages. Keep in mind that the Cardinal have traditionally used extra offensive linemen in lieu of tight ends in those heavy sets, but Schultz’s run-blocking ability was good enough that Shaw and offensive coordinator Mike Bloomgren would not only leave him out there in those situations, but also not hesitate to run behind him when needed. Because of how he excels in both elements of the game, it will be difficult for defenses to know what to expect from Stanford’s next star tight end on any given play — and with Schultz’s route-running ability, that split-second indecision could cost those defenders dearly. Greg Taboada (TE) — The senior took a step back in Stanford’s offense last season after Hooper’s emergence, notching just five catches for 66 yards after reeling in eight for 136 yards as a sophomore in 2014. The 6-foot-5, 248-pound tight end started to see more action in specialized packages, particularly in goal-line fade situations, in which he and Rollins Stallworth would line up on opposite sides of the formation and exploit mismatches against smaller defensive backs. Taboada isn’t anticipated to be a go-to guy on this offense because of Schultz’s projected emergence, but he can fight for tough catches and will likely continue to have his niche in goal-line and multiple-tight-end looks. Isaiah Brandt-Sims (WR) — Brandt-Sims is the fastest man on the team and can probably beat any defensive back in the country in a footrace, but his relatively small stature (5-foot-11, 181 pounds) and lack of versatility are factors that could hold back his emergence. When Brandt-Sims is on the field, it will likely be a safe bet that he’s going to be running a deep route to stretch the defense, which means that opposing defenses can just send safety help in his direction and limit the damage he can do. Expect him to see the field in some specialized packages, but because Rector also brings deep-play potential and a more versatile route tree, Brandt-Sims’ opportunities will likely be limited until Rector graduates at the end of this season. J.J. Arcega-Whiteside (WR) — With Devon Cajuste lost to graduation, Arcega-Whiteside is expected to step up and become Stanford’s next big possession receiver after using his redshirt last season. A three-star recruit out of South Carolina, Arcega-Whiteside has impressed in training camp but could be limited in his playing time with Irwin, Rector, Owusu and Schultz anticipated to be the top targets for Stanford’s quarterback, at least in the early goings. He’ll quickly emerge as one of Stanford’s premier targets in years to come, particularly once Rector and Owusu graduate at the end of the season. Jay Tyler (WR) — Tyler is one of the most intriguing pieces of the puzzle this season. In years past, Stanford hasn’t really found a place in its offense for players as small as Tyler (5-foot-8, 169 pounds), but the Louisiana native’s speed and elusiveness make him a tough guy to defend for opposing defensive backs. And if he lines up in the slot and gets matched up against a linebacker, watch out. Tyler brings a lot of possibilities: He could be used in a Kelsey Young-like role in sweeps and reverses; he might be used in the slot as a traditional receiver; he could be leaned on in the screen game. Tyler isn’t likely to see a ton of action because his size limits his run-blocking ability, but however Shaw and company do choose to use him, it’ll absolutely make for entertaining football. Kaden Smith (TE) — A torn ACL and MCL in December has held the nation’s second-best tight end recruit out of football action for fall training camp, but Shaw has stated that he would not be opposed to using Smith as a true freshman if his knee recovery goes according to plan. Smith is one of the most heralded pass-catching tight end recruits in recent memory after he recorded 144 career receptions for 2,260 yards in high school, including 57 catches for 917 yards as a senior — in the unforgiving world of Texas high school football, no less. Stanford will likely ease him into game action due to the nature of his injury and its many other options in the passing game, but if he does play this season, his freak athleticism is sure to demand a good look from the coaches. He also dunked a shot put once, so there’s that. Devon Cajuste (WR) — At the start of his career, Cajuste chose Stanford because it was the only school that would let him play wide receiver, his preferred position, instead of switching to tight end, which other programs thought better suited his body type. Once on The Farm, Cajuste worked hard to combat the perception that his big frame stopped him from being fast and nimble by posting 27 catches for 383 yards (14.2 yards per catch) as a fifth-year senior last season, and then going on to shock the nation by posting the fastest time among all side receivers with a 6.49 in the three-cone drill (an agility test) at the NFL Combine. Once he took over as a starter in 2013, Cajuste was one of Kevin Hogan’s most reliable targets, catching 91 passes for 1,596 yards as part of a stellar Stanford career. He’ll live on in Stanford lore for his legendary Senior Day performance against Notre Dame, in which he caught five passes for 125 yards, including a 27-yard completion with 10 seconds left on the clock that put the Cardinal in range for the game-winning field goal that capped one of the more improbable game-winning drives in recent memory. Austin Hooper (TE) — Along with Greg Taboada and Eric Cotton in the 2013 recruiting class, Hooper was expected to be part of the new-age “Tree Amigos” tight end crew when he first arrived on The Farm. That didn’t end up panning out, because Hooper quickly asserted himself as the best of the bunch and exploded one of the better pass-catching tight ends in the nation in two seasons as a starter, in which he combined for 74 catches for 937 yards and eight touchdowns. He tied Christian McCaffrey for second on the team with 53 targets last season before surprising many by forgoing not one, but two remaining years of collegiate eligibility to declare early for the NFL Draft and eventually become a third-round pick of the Atlanta Falcons. His departure opens the door for Schultz to seize the reins and become Stanford’s next impact tight end. Rollins Stallworth (WR) — He might not have had the flashy stats of the other receivers on the team, but that was never a problem for Stallworth, who put his head down and worked hard for five years to work his way up the ladder from walk-on wide receiver all the way into Stanford’s regular wide receiver rotation as a fifth-year senior in 2015. Stallworth’s contributions on the scout team and, later, as Stanford’s best run-blocking wide receiver, never showed up on box scores and made him easy for casual fans to overlook, but it says a lot that in 2015, when Stanford would send out its more run-heavy personnel packages, Stallworth would be the lone wide receiver out on the field as the wideout most trusted by his coaches to do the unglamorous work and block for his teammates without complaint. He was rewarded for his five years of service to the program when he caught the only touchdown of his career in garbage time against Arizona — and fittingly enough for him, it came on an end-zone fade.